Hindus worship their deities through ritual offerings called 'puja' which too often involve animal sacrifice. Just in these rituals,millions of animals are brutally slaughtered each year. Water buffalo, sheep, goats, sheep, ducks, chickens, crows, fish, pigs, snakes, turtles and grasshoppers are cruelly killed on numerous religious holidays or to have a wish fulfilled, to sanctify weddings, new homes and cars. Ironically, the death of the sacrificed animals is interpreted as a favor to the animals who are released from a life of suffering. The sacrifices are a massive bloodshed and during the festival of Durga Puja, once a year the soldiers of the center of Kathmandu behead hundreds of water buffalo and goats with one stroke to their head. During Nepal's largest festival, the festival Dasain in early autumn, up to 10,000 goats and other animals are sacrificed. Apart from sacrificing animals by slitting their throats and beheading, there are other extremely cruel forms to kill the animals, like several men ripping apart a live goat under water, burning live snakes and fish, skinning live pigs or tearing their heart out. Many rituals involve drinking animal blood, in some cases men bite of the heads of chickens, skin or cut buffalo or sheep to find their veins or even directly cut open a pig. 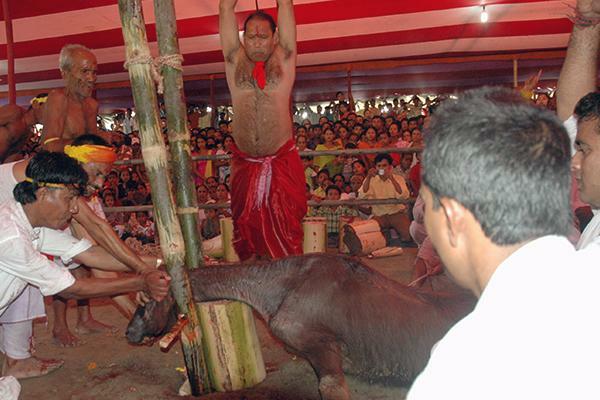 In Nepal these sacrifices are not only not regulated by law, but the government subsidizes some of them and participates in others like the festival of Dasain. In this "celebration" the government beheaded 54 water buffalo and 54 goats before the Nepali Army killed 108 buffalo, and another 108 were sacrificed simultaneously at Gurkha Palace. This "event" is even broadcast on public television. Ironically, even to celebrate Buddha's birthday, who preached maximum respect for animals, hundreds of goats are killed. It is estimated, that in Nepal alone, hundreds of thousands of animals are sacrificed each year. If we take into account India and other countries with hindi population, the number is exorbitant. If you want to visit a temple in Nepal where no animals are sacrificed, go to: Pashupatinath, Swayambhunath (Monkey temple), Boudhnath or any Buddhist monastery.